There’s no technology simultaneously more useful and frustrating than Wi-Fi. Wireless local area networking shouldn’t be rocket science at this point, even though it involves fiendish calculations and increasingly sophisticated physics. While setting up a Wi-Fi network has become simpler over time and networks more reliable, when a connection doesn’t work, you could tear your hair out. This might explain my expanding forehead space. I haven’t yet been able to crack why some OS X users continue to have connection issues with Yosemite. In successive updates, Apple has apparently solved frequent disconnect issues for some users, but they persist. However, in this column I walk through a mystery sent by a colleague that, in the process of working out, will provide a lot of insight for those of you troubled by the heartbreak of inconsistent conditions that ruin streaming. Aaron in Kansas City, a longtime email and Twitter friend, wrote in to brag about his Google Fiber throughput. No, wait, he didn’t (but I can still be jealous of gigabit broadband). Rather, his Google-supplied Wi-Fi router wasn’t playing nice with an array of Macs and Apple base stations. 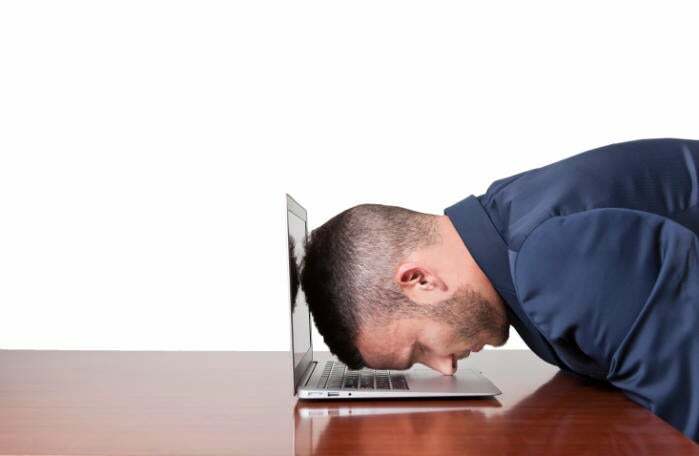 Despite having a raging torrent of bandwidth, Aaron couldn’t get consistent, hiccup-free streaming, among other problems, whether he used AirPlay or Rogue Amoeba’s Airfoil. A quick bit of background. Wi-Fi works in two different frequency bands, 2.4 gigahertz (GHz) and 5 GHz. Each band is divided up into channels to allow multiple networks to operate in the same area without causing direct interference. Apple started adding support for 5 GHz networking in 2006 with the Intel processor switchover. Apple began shipping simultaneous dual-band base stations in 2008—ones that could create two networks at once, one in each frequency range. The 2.4 GHz band is congested, but works well through walls and over longer distances; 5 GHz can’t penetrate solids as well but has relatively fewer users. Shorter distances mean less congestion, because fewer adjacent networks interfere. Consider whether interference is an issue. If you’re near an industrial area, some microwave sealers and other equipment can spit out noise in the 2.4 GHz band. Near a hospital or corporate campus? Their networks might overwhelm yours or, using techniques the FCC seemingly has now found invalid, may try to shut down “rogue” networks—any network that the system can’t identify as its own but which has a signal that their sensors can measure. It’s impossible without a spectrum analyzer or specialized sniffing software to see what’s truly happening in these bands, but you can get a survey of what other Wi-Fi networks are present with Apple’s built-in Wireless Diagnostics in OS X or iStumbler ($25). Apple’s program can be launched by holding down Option, selecting the Wi-Fi menu, and choosing Wireless Diagnostics. Then pick Scan from the Windows menu. You can scan for networks in your vicinity with Wireless Diagnostics. Split the 2.4 GHz and 5 GHz band. Nearly all modern 802.11n and 802.11ac routers, those using the latest two Wi-Fi specifications, accept connections simultaneously over both frequency bands using the same network name. However, you can create unique network names. This lets you force a computer or mobile device to connect to 5 GHz, which might be preferable to reduce interference or produce higher throughput. AirPort Utility lets you set the name of a 5 GHz network separately from the 2.4 GHz network. In AirPort Utility, select a base station, click Edit, click the Wireless tab, and then click Wireless Options. Check the 5 GHz Network Name, and enter a unique name. Click Save and then Update, and the base station restarts. Now choose the 5 GHz network name from any devices you want to force onto the 5 GHz network, and remove the original network name. In iOS, tap the i button next to the network you want to remove, and then tap Forget This Network. Confirm by tapping Forget. 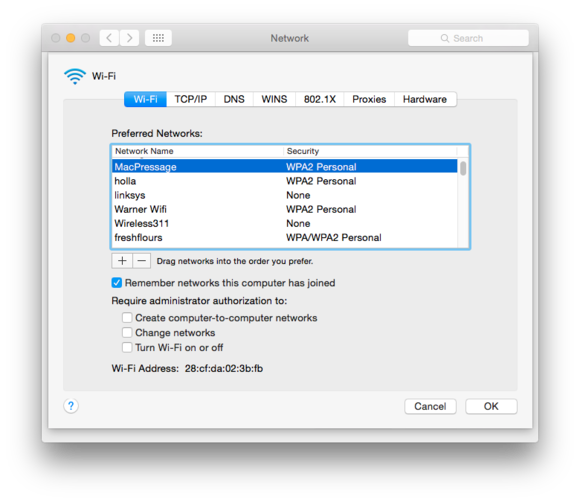 In OS X, in Network Preferences, select the Wi-Fi adapter, click Advanced, select the network in the Preferred Networks list, and then click the - (the minus sign) and confirm by clicking Remove. Click OK, and then click Apply. Remove an unwanted Wi-Fi network to prevent an automatic connection. You can also use AirPort Utility to see what band and at what speed any given device has connected. Click a base station, hover over a name in the Wireless Client lists, and you’ll get a popover. The PHY label will say b/g/n for 2.4 GHz and a/n or a/n/ac for 5 GHz. With multiple base stations, make sure they’re all using the same security. In troubleshooting Aaron’s mystery, I may have solved one of my own. We have three base stations in my modestly sized house in order to fill in poor coverage areas at opposite ends of our partly finished basement. The automatic handoff (roaming), that’s supposed to work seamlessly, fails frequently. I discovered that my main base station was using mixed WPA/WPA2 Personal security, a legacy mode that supports really old Macs and other devices, while the other two base stations used WPA2 Personal. I updated the configuration on the main base station, and the roaming problems have appeared to disappear. Unfortunately, none of these suggestions helped Aaron. Aaron turned to local home-theater specialists for help. This profession has grown in leaps and bounds over the last several years as many people have bought an interconnected array of equipment and installed 5.1 or 7.1 speaker systems. Such installers now have to be network gurus, too, because so many devices are Internet or network capable. Using a site-survey tool, his consultants found 19 networks visible from Aaron’s house. The 2.4 GHz band used for Wi-Fi has 14 numbered channels, 11 of which are legal to use in America. (Various channels are available in different countries.) However, adjacent channels all overlap a bit, and can cause network slowdowns. Channels 1, 6, and 11 mostly do not overlap, and Aaron’s installer found that all networks he discovered in a scan were on those three channels and most on channel 11. This amount of co-channel usage can definitely crimp reliable throughput. The installer moved Aaron’s 2.4 GHz networks from channel 11 to 8, and fixed a configuration problem that properly split the 2.4 and 5 GHz networks into two unique names. That seems to have done the trick: no more audio stuttering. I typically don’t recommend using any but channels 1, 6, or 11, because any other channel interferes with and is interfered from the overlap of at least two other channels’ traffic (1 and 6 or 6 and 11). There’s one more trick Aaron didn’t employ, but it’s useful to know. It’s a little-known fact outside of Wi-Fi nerd circles that some 5 GHz channels use much higher-signal strength to send data than others. The low-numbered channels available in many countries (36, 40, 44, and 48) can use just 5 percent—yes, 1/20th!—of the power of a high-numbered channel (149, 153, 157, and 161) under American regulations. With the default automatic channel setting, a base station will almost always pick a low-numbered channel whenever it’s restarted. If you lock the channel to 149 or above, you can often enormously extend the network’s range—though you may then interfere with neighbors’ networks, which can reduce both networks’ maximum throughput. To change the channel with an Apple base station for either 2.4 GHz or 5 GHz, follow the steps as above to set a 5 GHz network name, and you’ll see pop-up options for 2.4 GHz Channel and 5 GHz Channel. If these are set to Automatic, pick channels based on a survey you’ve done with iStumbler or Wireless Diagnostics, and then click Save and Update to restart the base station with the new settings. Setting the 5 GHz channel to one of the higher numbers ups transmission power by up to 20 times that of the lower-numbered channels. Wi-Fi in general and Apple in particular want Wi-Fi to work without any extra configuration. A few clicks, a selection, and go! Thus, when something’s awry it’s often quite obscure or maddening because it’s so far out of the norm. Aaron had to call in experts, but now you’re equipped to tackle the challenge solo.